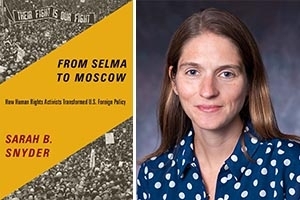 SIS Professor Sarah B. Snyder’s latest book, From Selma to Moscow: How Human Rights Activists Transformed US Foreign Policy, examines the role that activism of the “long 1960s” played in the incorporation of human rights into US foreign policy. During this period, from 1961 to 1977, the US government elevated the importance of human rights in its dealings with other countries. This elevation was due in large part to American activists committed to both stopping human rights violations abroad and preventing the US government from supporting foreign governments that violated citizens’ rights. Her book draws examples from five countries: South Korea, Southern Rhodesia (current-day Zimbabwe), Chile, Greece, and the Soviet Union. Snyder explains that an important shift in the conversation around human rights occurred during these years. Activists interested in international human rights moved away from considering the rights of citizens or groups of people, and increasingly towards “the rights of individuals as human beings,” she said. Human rights activists in the long 1960s were largely concerned with specific rights that governments systemically violated. These included rights focused on bodily integrity, like freedom from torture, political imprisonment, and racial discrimination, as well rights allowing full expression in society, like the ability to practice religion and participate in government. Activists engaged in a range of tactics intended to bring human rights violations to the attention of the US government and to raise awareness of human rights abuses to the American public. Some activists were heavily focused on the US government’s role in world affairs and testified before Congress or engaged in letter-writing campaigns. Others traveled abroad to undertake fact-finding missions, observe trials, and interview people about conditions on the ground. Beyond pushing for and achieving changes to US foreign policy, these activists helped popularize the idea of human rights among Americans. “By having a bureaucracy tasked with monitoring human rights, a much wider American audience would inevitably become aware of and care about the human rights conditions in other countries,” said Snyder.